The Army Body Fat Calculator is offered by Calculator Market to help you to find your shape body. It indicates if your body fits the army’s requirements. This calculator is a tool that has been created by the US army. This tool makes an health estimation possible at home. According to some criteria such as gender, age, height, weight, abdomen size and neck size, this product computes the fat that’s inside of your body. It uses a specific equation which is different from male to female. Because the army physical chart is unlike a man to a woman. The Army Body Fat Calculator calculates the fat rate from imperial units. Because the Army Body Fat Calculator is a tool used by the US army, it’s very precise. To enter in the army there are very tight physical requirements. According to the 2018 army charts, for a 21 to 27 male to join the US army there’s maximum allowed 26 percent body fat content. Once people are in the army, there’s a body fat content regulation. A 21 to 27 male is allowed 22 pt of body fat content. For a same age female this is 32 pt. People who want to do military service have to meet fitness standards. That’s why the Army Body Fat Calculator allows them to check if they could become a military or not. Thanks to the army body fat calculator, you can now know if you’re able to join the US army and if you’re in a good physical condition. Let’s complete the test downloading the Army PRT (Physical Readiness Training). So you could train like a real soldier. The Army body fat calculator is a specific army tool. Navy force and air force don’t use this same composition to select the marine and pilot people. For the civilian people, the Army Body Fat calculator indicates the BMI (Body Mass Index). This tool makes them enable to test their health on their own without any doctor nor mathematic knowledge. How does the army body fat calculator work? Once you tape all these data, you’ll get your fat content percentage. Also you could get an advice from the calculator (keep training! or congratulations!). 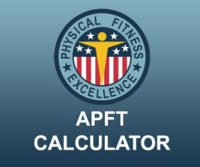 Complete your score with the Army Physical Fitness Test connecting on APFT Calculator. For you to understand what you have to do APFT uses pictures. Using both army body fat and APFT calculator, you could check up your physical health.